It was quite obvious that the proposed plan by Muhammadu Buhari to visit Enugu in BiafraLand was foiled by angry Biafrans who storm the street to register their pains and grievances over the continuous detention of their leader Mazi Nnamdi Kanu, Biafrans who were arrested and also to demonstrate their pains through peaceful protest over the killing of Biafrans by the Nigerian military who acted according to the order given to them by President Muhammadu Buhari. The protest which took place on the 22nd of December 2016 amazed everybody including the retired Gen. Muhammadu Buhari and the Nigeria military because they never expected to see a large number of Biafrans who turned out for protest again since they were constantly been arrested, shot at and killed during the last protest which recorded lots of innocent Biafrans dying. The most amazing part of the event is that the exercise was carried out even in the presence of the Nigeria military that were sent to murder Biafrans, cause havoc and create fears in BiafraLand. As a result of the outcome of the event, IPOB worldwide has been hailed by Biafrans, friends of Biafra and lovers of Freedom as well as observer's for the strategic denial of visa to President Muhammadu Buhari into BIAFRALAND. "He shamelessly cancelled his visit to BiafraLand." Noted a hard-core Biafran and the founder of Family Writers, Emeka Gift. "Those who deny freedom to others don't deserve it for themselves". This actually shows that Muhammadu Buhari and anything that represent Nigeria don't deserve freedom to come or do anything in BiafraLand. Mind you; yesterday it was Muhammadu Buhari but tomorrow, it will be anybody or anything that have to do with Nigeria. Yesterday is gone, tomorrow is another day and it won't be all that easy for murderers, terrorists and political demons to escape the wrath of God and anger of the People so Marginalised. It came with warning last time but next time they may not be lucky enough to receive any warning. Those who are following the events will agree with me that Biafrans do not accommodate nor welcome terrorists into their territory. Biafrans have a history of resistance to anything inhuman, oppressive and without value for life, which Nigeria represents. Terrorists, political murders, enemies of Biafra and anything that represent the contraption called Nigeria should start withdrawing themselves from BiafraLand because their days of atrocities and evil against Biafrans is over. "It's a total embarrassment and mockery to us if we allow the terrorists and murderers who murdered Biafrans to feel comfortable to come to BiafraLand and place their foot on the same soil they shed the bloods of our fallen hero's, mother's and siblings." It's definitely not acceptable. Those who murdered or supported the killing of Biafrans will never get away with it. Besides, the blood they shed in BiafraLand will continuously chase and hunt them and their family." The mass protest in Enugu should not only be considered as just a sign of the inevitable disintegration of Nigerian but that the warning also implies to the politicians in BiafraLand who play politics with the lives and interest of the people. 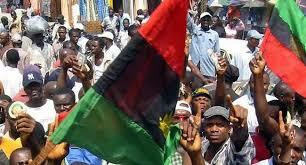 Biafrans no more welcome nor accommodate murderers and enemies of Biafra neither do they welcome anything born of evil. So they should withdraw themselves and avoid BiafraLand.